More than a week since a blog posting! What can I say, except that I have been taking this retirement thing to heart and relaxing. We are members of the Escapees RV Club. It was founded by and for fulltime RVer’s more than 30 years ago. 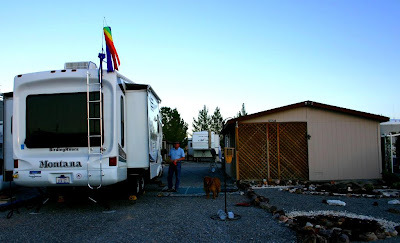 They have all kinds of information on the fulltime RV life style and were invaluable as we planned our new life. They do our mail forwarding. They also own 8 RV Parks for members scattered from Florida to Arizona. When they started building these parks there was a desire to speed up the process of adding parks, but they could only do so much and only had so much capital. Club members came forward with the idea of Escapee CO-OP Parks. These parks would be built and owned by groups of Escapee members that would make their sites available to other Escapee members when they were not in use by the original owners. There are 11 of these parks from Washington to Florida. Both the Escapee owned and CO-OP Parks are much nicer and cheaper than the typical commercial RV Park. 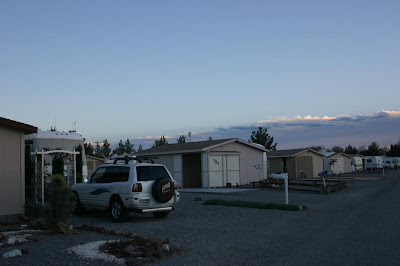 After we left Kingman we went to our first CO-OP Park located in Pahrump, Nevada. Pahrump is about half way between Las Vegas and Death Valley or about 60 miles from each. The Pair A Dice CO-OP RV Park is one of the nicest parks we have been to and is in a very quiet area. We came here to relax for a few days and have ended up staying for 10 days. Everyone here is very friendly. It usually takes us an hour to do Raider’s morning walk, because everyone wants to pet him and take time to chat. 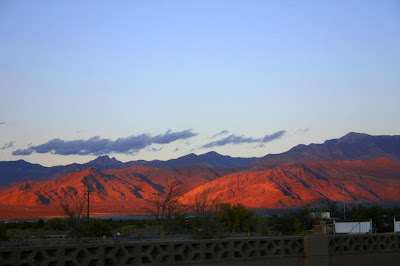 The town of Pahrump is spread out across a typical Nevada desert valley with some great views. The area has limited shopping (Wal-Mart, Walgreens, Albertsons) and 5 small casinos. Unfortunately, all of the casinos are very smoky and not somewhere we would want to spend any time. 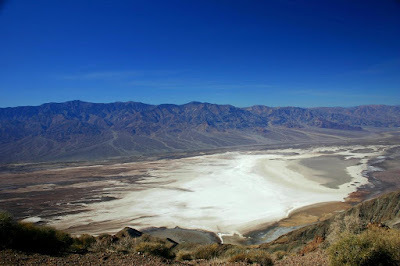 A little more than half way between Pahrump and Death Valley is the Ash Meadow National Wildlife Refuge. 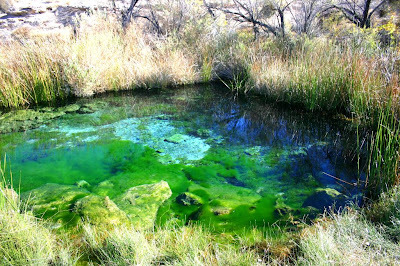 This refuge was created to protect Desert Pupfish. 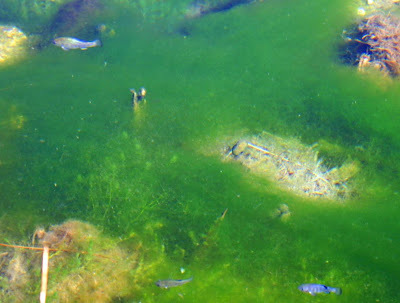 These fish are about the size of guppies and live in various small pools in this part of Nevada and California. Each pool has its very own distinct species of Pup Fish and all are endangered. Although the refuge was created to protect the Pup Fish it also protects all of the other desert species in the adjacent area and with the pools make up a good birding area for desert birds such as Phainopepla, Gambel Quail, and Gold Finches. Death Valley is truly a unique place. 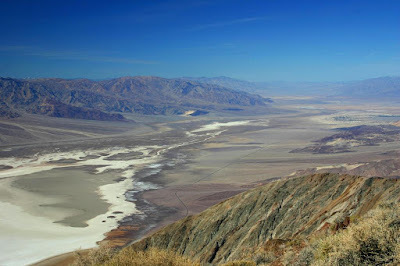 The valley’s lowest point is 282 feet below sea level (and the lowest point in North America), but its highest peak is over 11,000 feet and both can be seen in the same frame from Dante’s View. The hills in Death Valley are so barren that not even weeds can grow on them. 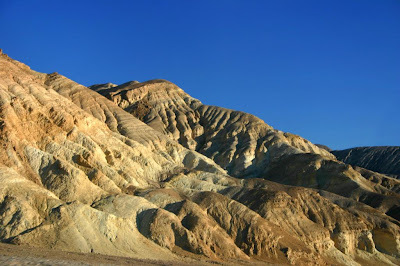 It had been 34 years since Kathy and I had been to Death Valley and happy to say that it hasn’t changed at all. 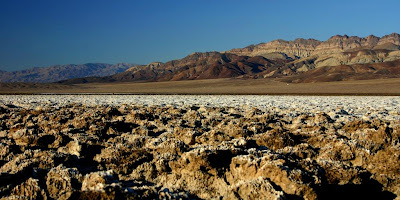 Death Valley covers 3,000 square miles; it’s all time high temperature was 134 degrees and it regularly hits 120 in the summer. In the winter and spring it can get down to freezing on the valley floor with deep snow on the high peaks. During the prime visitation seasons of fall and spring it also gets thousands of RVs. On our day trip to Death Valley we even found a few roads that we had not been on before and our total mileage for the day was 230 miles. The weather was outstanding in the high 70s and as you can beautiful blue skies. Where are you guys headed now?